Record Foreclosures. Mortgage Meltdown. Credit Crunch. The headlines are filled with doom and gloom about the housing market. Despite the bad news, millions of people in the United States still want to achieve the American Dream of homeownership – and millions more are trying desperately to hang on to homes they previously bought. Maybe you’re one of them. Too bad nobody ever taught you how to become a smart homebuyer – or even told you the whole truth about whether you were really ready to own a home at all. In Your First Home: The Smart Way to Get It and Keep It, Lynnette Khalfani-Cox, The Money Coach, offers a no-hype personal finance guide that will help you prepare for, find and finance the home of your dreams – and not lose it to foreclosure. For those worried about making the leap from renter to owner, Lynnette explains how to turn bad credit into perfect credit, in seven simple steps. She also offers scores of tips on how to manage money and save cash – even if you’ve never been able to budget. Best of all, Lynnette walks you step-by-step through the house-hunting and mortgage application process, saving you time, money and unnecessary frustration. Homeownership isn’t a right. It’s a major responsibility. 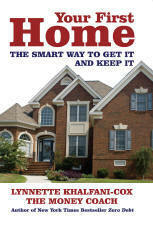 Your First Home offers a realistic look at the entire life cycle of being a homeowner – with all its joys and pains.